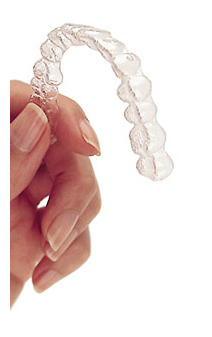 Invisalign straightens your teeth with a series of clear, virtually invisible, custom-molded aligners. Invisalign uses breakthrough technology that lets you have the smile you've always wanted without the hassle of braces. By using a series of clear, removable aligners, Invisalign straightens your teeth with fast results. The course of treatment involves changing aligners approximately every two weeks, moving your teeth into straighter positions step-by-step, until you have a more beautiful smile. And unlike braces, these clear aligners can be removed while you eat and brush your teeth as usual. Since Invisalign is practically invisible, there's no unwarranted attention to your mouth. In fact, very few people will notice at all - unless you tell them. They're comfortable to wear and easy to remove when you eat, brush, and floss.